This was once our nation’s view of immigrants. So when did the United States of America stop being a nation of immigrants? When did we stop welcoming the tired, the poor, the huddled masses? Well the truth is, with every immigrant wave that has broken upon the shores of this infant nation, has come an equal wave of nativist anti-immigrant sentiment. The only immigrants to have come to this land, now known as the United States of America, who did not face opposition of some type, were the people who eventually became known as Native Americans. These people are believed to have crossed a land bridge that no longer exist, which connected Asia and North America, or possibly may have traveled by boat as well. The next immigrants to set foot on the shores of North America were Spanish and French in the 1500s, who began establishing settlements in what would become the United States. They were followed by the English in 1607 when they established their first permanent settlement at Jamestown. Many of the earliest immigrants to America came seeking religious freedom, such as the Pilgrims and Puritans. Others came seeking economic opportunities. Many of which who came as indentured slaves . Others were criminals who were shipped to the new world from Europe. While these early immigrants from Europe were initially welcomed by the Native Americans, it wasn’t long before the new comers were encroaching on hunting grounds and other sacred lands, which led to conflicts between the two Peoples. We have to mention that during all of this there was another group of people being forced to migrate to the new world. African slaves were brought to this country against their will, some estimates put the number between 500,000 to 650,000 slave brought to the United States between the 17th and 19th centuries. 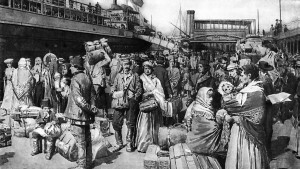 The next significant immigrant wave came in the mid 19th century around 1815 to 1865 coming from Northern and Western Europe, a third of these from Ireland, which suffered a famine. In the 1840s almost half of all immigrant to the United States were from Ireland. 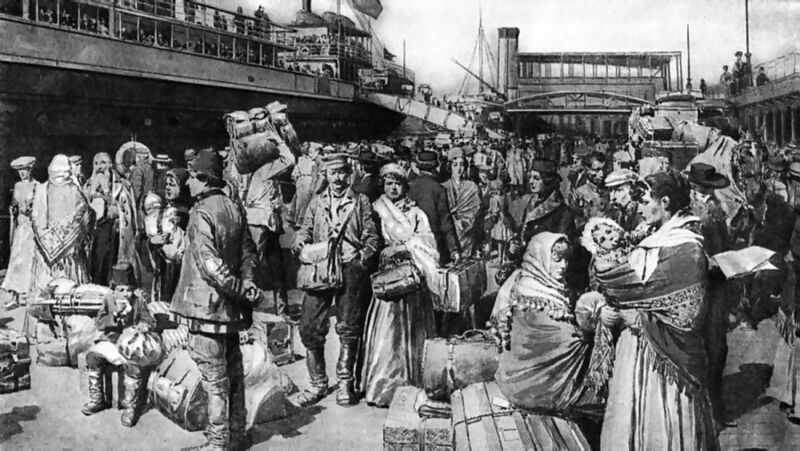 This wave of immigration witnessed a substantial nativist anti-Irish, anti-Catholic sentiment since the Irish immigrants were predominately Catholic. This anti-Irish sentiment was so extensive that it spawned a political party, the American Party, also known as the “Know Nothings”, whose main goal was to curb the number of immigrants. The fear was that the Irish Catholic immigrants, due to their high birth rates would take over local governments. There was also the fear that they would have a negative effect on labor, since they were willing to work for much less, the Irish were even known to underbid slave labor in the South. This fear was also inflated by the large number of Chinese immigrants moving to the Western Territories following the California Gold Rush. Does all of this sound familiar? At the time of the Irish wave of immigrants it was believed that to allow an unlimited number of them to come into the country would doom the nation’s future, that it would mean the end of the predominately Protestant culture of the times. All kinds of stereotypes were put out about the Irish, many survive to this day. Such as they were all violent drunks, and lazy. This in the face of the facts that it was the large immigrant populations that worked on some of the largest public service jobs like sewers, canals and railroads, and for much lower wages than native-born Americans. One might say that the Irish were taking the jobs that Americans didn’t want, or wouldn’t take for the same pay. Again, sound familiar? Our nation has a long history of immigrants, we are a nation of immigrants. Unfortunately we also have a long history of anti-immigrant sentiment. It seems to be human nature for the people who are first to come somewhere, to then want to limit, if not completely ban, others from coming. I can’t help but liken the current attitudes towards immigration to the historical attitudes towards immigration. I would also call attention, on a smaller scale, to the people who have moved to Sussex County, who then want to limit growth to put a stop to the number of people coming to Sussex. There has been a lot of talk about immigration lately due to President Obama taking the extraordinary measure of an executive order to allow millions of immigrant to stay in this country, even if they have come here illegally. Let me be clear, I do not believe that president Obama has this authority from the Constitution. I would like, on the other hand, to address a separate question. Do we as a nation need immigrants? The question is not whether, or not the President can do what he has proposed to do. I have already stated I do not feel he can. The larger question is, do we need immigrants, and can they be, or are they a positive influence on our nation, our culture, and even our economy? Let me be clear, I have heard all of the negative arguments against immigration, both legal and illegal, hell I have made most of them with a sincere heart. But if we are to be intellectually honest when making any argument, then we must not only consider one side of the argument, but both sides. If we look back again to the 1800s, and the view that the Irish, and Chinese immigrants would be the death of the nation, and the American culture, whatever that may be, we can see the parallel to today’s South American immigrants. Many if not all of the same arguments are being made. That the Hispanics will take over. That our culture will not survive, that they have so many children that they will soon out number the native-born Americans. That they take jobs from native-born Americans. The political aspect cannot be overlooked either, since both of the major parties pander to this voting group. But while we look back to the 1800s, we must also look forward from that history to today. Would anyone dare to say that the Irish-American community within the United States has not been a positive influence on this nation? They helped build this nation, large numbers have fought and died for this nation and what it stands for. Cities such as Boston, Philadelphia, and Chicago have large, proud and respected Irish populations. Their traditions have been incorporated into our everyday lives. And while it is not the holiday in Ireland that it is here, the nation celebrates St. Patrick’s Day ever year. Our history of immigration has almost always been followed by a history of growth and prosperity. What we need to remember, is that our system of economics is a supply and demand based system. This means that the more people we have, the more demand is created, and the more demand, the more incentive to create the supply. Thus a growing population equates to a growing economy. We can look again back to history. Following the Irish and Chinese waves, quota laws were passed to limit the number of immigrants. These laws were passed in the 1920s. Now correlation does not prove causation, but it is true that following the limiting of immigrants in the 20s we saw a Depression. Then following WWII in the 1950s these quotas were relaxed to allow immigrants and refugees to come to the United States. Can anyone deny that the 50s were a time of growth in this nation? One could even point to the so-called amnesty that Ronald Reagan signed into law in the 80s as a contributing factor to the growth we saw from that Administration’s time. Now of course many will say that all of these historical examples I have given are made up of “legal” immigrants. And I would agree. The current one is made up of “illegal” immigrants. I would again agree. So let us ask the question. If we are seeing in historical waves of immigrants a growth in our economy, but we are not seeing the same in the current wave, what is the difference? Could it be the current nativist anti-immigrant sentiment that has forced our politicians to be hesitant to allow people to come here legally? We even have our modern-day version of the “Know Nothing” party in the TEA movement, which though started as an anti-tax movement has been infiltrated by an anti-immigrant faction. As I have considered the question of immigration I have had to be honest and admit that what we are doing is not working. We are not stopping people from coming here, and we are not reaping the full benefit of them coming here. The current attempts to stop people at the border are a meaningless attempt at quotas, it is not working. And because we force those who do make it in to live beneath the radar, we are not able to incorporate them into the system. Many of them are paid in cash, and do not pay taxes. And because they are vulnerable, they will work for less, which has a dampening effect on wages overall. They are forced to live a subsistent life style. Many of these “illegal” immigrants are afraid to strive for more than simply getting by, the fear is that the more they become entangled within the system, the more likely they are to be discovered and deported. Now imagine this fear were removed, imagine that this large segment of our community suddenly were incorporated fully into the system. They could seek better employment, for better wages, they could start businesses and hire people. They would want better homes, they would want better things. In other words, they would create more demand for goods and services. But more importantly, they would be paying into the tax pool, and instead of simply taking advantage of our schools and other entitlement programs, they would be helping to fund them. And possibly would actually have less need for them. I had thought of attempting to make all the old arguments for why this is a bad idea, but I will leave that to my guest if they choose. I will respond, because as I said above, I have made those arguments in the past myself, I know them well, but in thinking this through I have realized that many of those arguments are misplaced, and steeped in a fear of the unknown, and or things that are different from ourselves. We as humans seem to have a built-in reaction to chafe at new things, or change. We believe that because this is the way things are while we are here, then things must forever remain that way long after we are gone. We believe that because the nation was founded by English-speaking people, that it must remain an English-speaking nation. If that were the case throughout history we would all be grunting like cavemen. It may be that to protect the principles of our nation, we must be willing to allow the culture to change. How better to grow the number of Liberty loving people not only around the world, but right here at home, then to welcome more people to share our Liberty? 18 Comments on "My Grandfather’s Father"
@Mayo: This new wave of immigrants has not been “required” to assimilate? Required? You mean like the Borg assimilated entire species? Resistance is futile. Larry, that is false. My wife and daughter are both involved in the school system. Yes, like all first generation immigrants the Hispanics tend to create sub communities, you know like how all the major cities ended up with “Little Italy” and “China Town” sections. But their children and their children’s children learn English and participate in all the things that kids with native born p[aren’t do, and of course their heritage influences the overall culture of America, the same as we now eat a lot of Italian and Chinese food. But tell me Larry, exactly what you mean by ” Americanized”? Larry respectfully I must disagree, generations of immigrants of past did not “assimilate” per se. My wife’s grandparents who were Italian came to America, they did not give up their cultural ways. My wife’s grandfather learned enough English to get by at work, her grandmother barely spoke English. My Scottish great grandfather was a ship builder he barely spoke a lick of English and when he did I could barely understand him. While my great grandfather embraced the United States as his new home he never became “Americanized”. Perhaps those of us who are generational off spring of our ancestors have become to intolerant because sadly we have forgotten our families were also immigrants at one time. Who are you people and what have you done with the angry idiots who used to populate this site? Oh, immigrants, I see. Sorry, my bad. So now, let’s see, how do we take action against those who don’t agree with us about the value of the immigrants among us? Let’s pick a candidate for the Republican nomination for President who’s taken a vigorous swipe at Obama’s plan (which is, after all, raw meat bait for the Republicans to pass a plan) and give ’em a hard time. A great deal of assimilation occurs “voluntarily” in the sense that immigrants see it in their interest to adapt to the dominant culture because that’s often the most efficient path to getting along and getting ahead. But some communities have not assimilated and do not especially want to. Think the Amish here. And then there is the model of “required” assimilation that Mayo nostalgically speaks of with such admiration. Let us hope he is not yearning to bring back the Indian boarding schools where students were separated from their families, given Anglo names (Jim Thorpe), forbidden from using their native language, and made to dress, act and think like Americans–which of course meant Americans of western European descent. And if you think this was all that long ago, think again. Enrollment in Indian boarding schools peaked in the 1970s. Honi, I also think that many like Larry also lose sight of the fact that a true melting pot means that not only do the immigrants take on “American ways”, but American culture is broadened by their presence. It seems as though some seek out the “perfect time” in history and then attempt to stop time. We as human animals, as a species have always grown, changed and evolved both personally, and culturally. Notice that Larry seems to be hung up on how people behave as far as language and culture. And has failed to address the question of if immigrants can benefit our economy. The most important criteria in my opinion is that immigrants are willing to respect the rule of law, particularly ,and especially the Constitution of The United States. When I hear them chanting “si, se puede” at Obama’s anti Constitutional actions, I have my doubts. It’s easier for Rep. Boehner and the Republicans to bust on “illegal immigrants” “taking” American jobs than to do anything about their corporate “contributors” off-shoring American jobs. Conservative Dave, why should they respect it when they are told it is why they can’t come here’s. Delacrat it is easier to make wise cracks than to make meaningful suggestions. Delacrat, I would say the same. Would that be because of a cheaper source of labor, and less regulation? Or because Americans demand cheap crap from Walmart? Both. Principles of convenience, Buy American! unless Walmart has this great sale going on, then well… Principles are for political campaigns, values are for church. Such things should not intrude upon our daily lives however. And of course “Give me your tired, your poor, Your huddled masses yearning to breathe free, The wretched refuse of your teeming shore. 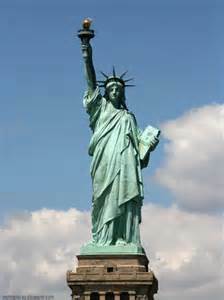 Send these, the homeless, tempest-tost to me, I lift my lamp beside the golden door!” That’s just for statues. So there was no executive action? Plus why are conservative republicans so obsessed over punitively attacking Hispanic immigrants and not the least bit concerned about the people who hire them? Racism/hate motivates lower middle class conservatives to action?